Gurgaon-headquartered real estate advisory and brokerage firm Square Yards Consulting Pvt Ltd is set to merge with real estate research portal Realizing.in, as per a press statement. The move is aimed at capturing 15 per cent market share of India's real estate search market in the next few years, the companies said. 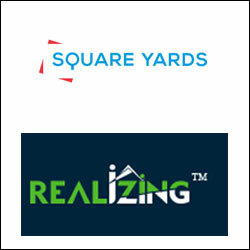 As part of the deal, the entire team of Realizing, which is owned by IDW Technology Pvt Ltd, would join Square Yards. Realizing's founders Vivek Agarwal and Hitesh Singla would be inducted into Square Yards executive committee as partners, the company said in a statement. Financial details of the merger are not disclosed. The Realizing.in portal would be rechristened as Square Yards and the group would continue to build research capabilities under the Realizing brand, the statement said. The ultimate aim is to evolve Realizing into a big data analytics platform for global real estate. Square Yards, which operates a portal by the same name, has been involved in real estate transactions worth $350 million since starting operations, CEO and Co-Founder, Tanuj Shori said. “The joining of Realizing team adds the much needed technology bandwidth to achieve larger scale,” said Shori. Founded in 2013 by husband-wife duo Shori and Kanika Gupta, Square Yards offers solutions for property-related needs. It caters to residential projects, hotel projects, student accommodation and mall redevelopment. Shori is an alumnus of IIM-Lucknow and has over a decade's experience in the capital markets business. He started his career with a short stint at Standard Chartered Bank and moved in as an analyst with Lehman Brothers. He served as executive director (equities) at Nomura before starting Square Yard. Kanika has worked with ICICI Bank, Tata Asset Management and other companies before starting Square Yards. Square Yards had raised $6 million (Rs 32 crore) in a pre-Series A round of funding from a clutch of unnamed investors in May this year. The company claims to have clocked revenues of Rs 38 crore in its first year of operations. Founded in 2014 by Rohit Raghav, Hitesh Kumar Singla and Vivek Agarwal, Realizing offers services such as city heat-maps, carpet area and built-up area calculations for property transactions. It also helps users with key property-related decision based on automated algorithms, the statement said. India’s online property search market has evolved radically over the last few years. The leading companies in this space are SoftBank-backed Housing, News Corp-backed PropTiger and Tiger Global, Accel Partners and Google Capital-backed CommonFloor besides the legacy players—Times Internet-promoted MagicBricks, Info Edge's 99acres.com and Chennai-based IndiaProperty. In March, News Corp acquired VCCircle Network, which operates this news website.